I wrote my last post, declaring my love affair with spring, a mite too soon. 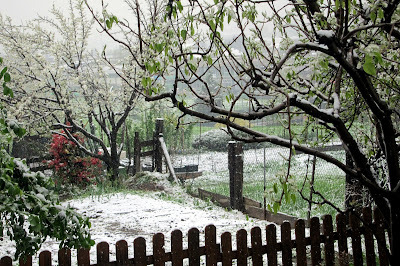 Yesterday I woke up to a snow storm. Needless to say, it made me quite disgruntled. In need of something to warm ourselves up from the unexpected winter blast, we held an impromptu polenta party last night. There is nothing more ‘warming’ than standing and stirring over a boiling pot of polenta for an hour! The good company and flowing wine doesn’t hurt, either. 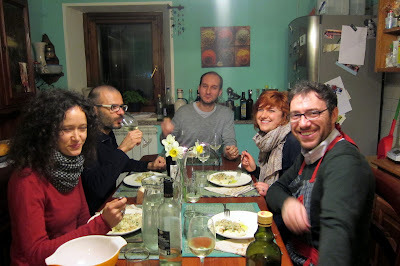 Polenta brings everyone to the table! I was desperate to try some of my new ‘rainbow’ polenta, semi-locally grown (about an hour’s drive from us) from ancient heirloom varieties of corn and stone ground in a local mill. I was almost hesitant to cook up this polenta, because it is so beautiful, but then I remembered that I can always get some more. We made two different varieties of polenta, and three different toppings. The first, meant as an appetizer, was polenta ostenga con gamberetti (white polenta with baby shrimp), and our main course was polenta morado viola con salsiccia e funghi porcini (purple morado polenta with Italian sausage and porcini mushrooms). Today I’ll show you how to make the white polenta with baby shrimp. Folks, this is shrimp & grits! Granted, I’m a vegetarian so I’ve never eaten shrimp & grits, but being an American from the south, I can appreciate them from afar. And discovering that Italy has a nearly identical traditional dish is just really exciting for a foodie, even a vegetarian one. This is a traditional dish from the Northeastern Italian region of Venezia, and there it is made using schie, which is a very small and grey colored fresh water shrimp. We can’t easily get those where we live, so we got gamberetti, which are very small red shrimp. I used white ostenga polenta, which comes from an heirloom variety of corn, and it is more finely ground than the coarser polenta we usually see around our parts. If you can’t get this, or white polenta, stone ground white cornmeal (finely ground) should work well. This is also really interesting because this polenta is prepared so that it is much more liquid than normal polenta, and it is basically grits. In fact when I tasted it last night, I lept into the air and started hollering about grits, I was so excited. Finding local grits is quite a thrill for a displaced American girl! Boil your water and salt, and slowly whisk in the polenta. Whisk until it starts to thicken, and then lower the heat to medium-low and switch to a wooden spoon. Give it a good few stirs every couple of minutes (or constantly if you are able), and cook it like this for an hour. For detailed polenta making instructions go HERE, remembering that this polenta recipe needs more water than the usual amount. When the polenta is nearly ready, start on the shrimp. If you have fresh shrimp, boil and clean them. If they are frozen, briefly boil and strain them. Heat up your olive oil in a pan and add garlic. 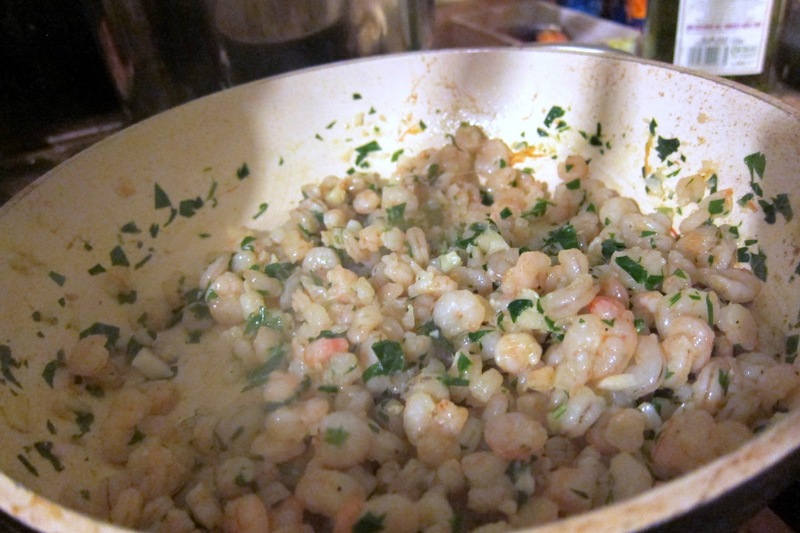 When it becomes fragrant, dump in the shrimp, add a few glugs of white wine. Over medium flame, cook for a few (maybe 4) minutes until the wine mostly dries up. Season to taste with salt & pepper, and mix in parsley. When it looks like this, it is ready to eat. 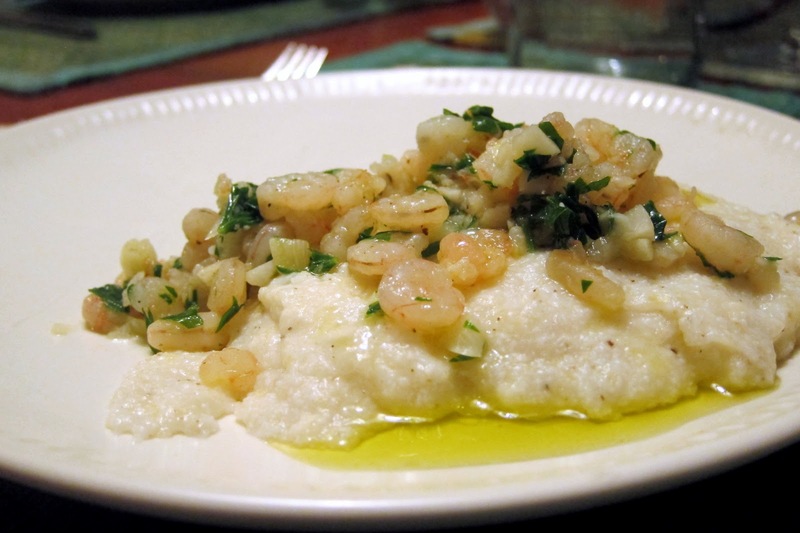 Serve over the white polenta, drizzle with some mild extra virgin olive oil (preferably from Liguria or Lago di Guarda) and drink with a white wine that goes well with fish, like Vermentino. 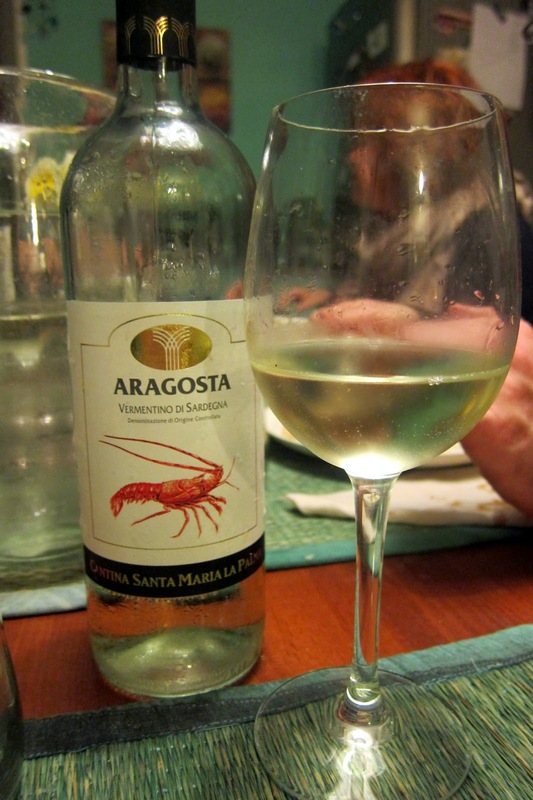 Wines from places that eat a lot of fish tend to go well with fish! Stay tuned for more polenta recipes! 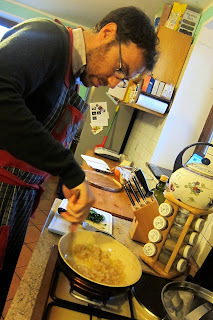 I do think I could happily eat polenta, and write about it, every day for the rest of my life. 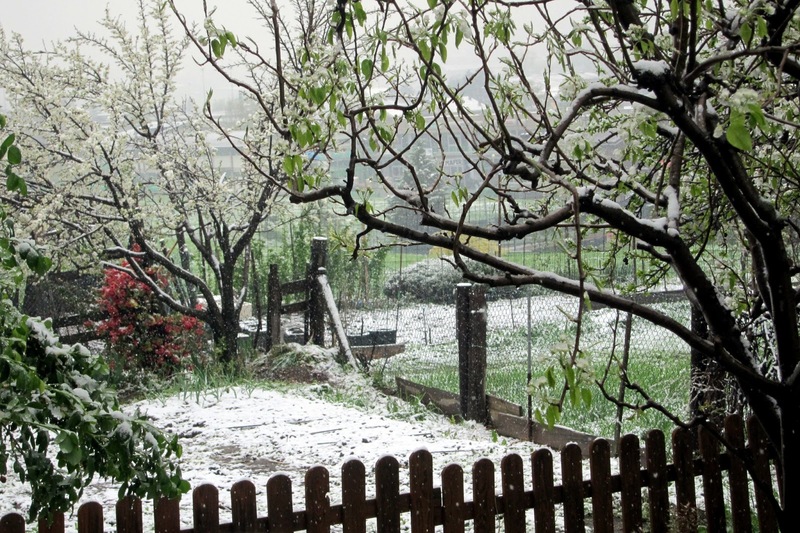 ← Spring in the Alps and a Tasty Springtime Snack!